Overview - Outside a small bar in Kingston, NY, Mark Hogancamp was beaten nearly to death, his memories wiped away. Seeking recovery, he builds Marwencol, a miniature World War II-era town filled with doll versions of his friends, fantasies, and even his attackers. As he documents the town’s dramas with his camera, the dolls become living characters in an epic tale of love, adventure, resurrection and revenge. When his photos are discovered by the art world, Mark is suddenly forced to choose between the safety of his imaginary world and the real world he’s avoided since the attack. Imagination is a powerful thing. It's the source of our dreams, our hopes, our fantasies, and deepest desires. It's the very core perhaps, of what some might call the soul. Without imagination we are merely lifeless slaves to logic and reason, devoid of passion or joy. When we are born into this world our minds are already eager and willing to take in all that surrounds us, to reshape and reform it, molding it and reprocessing it through our own subjective viewpoint to be released again, kicking and screaming, wild and naked out into the air as something new. In these first years, for most of us, one such early foray into creative expression comes in the simple form of playing with toys. Whether they're dolls, action figures, or stuffed animals, toys provide children not only with a means of entertainment, but with an creative outlet. In 'Marwencol', the feature documentary debut of director Jeff Malmberg, a mentally and physically wounded grown man returns to that once simple world of dolls, and through his imagination, elevates the act of playing with toys to a new artistic height. He does this not out of a desire to create art, but out of a primal necessity to rebuild himself. It's the story of one man's rebirth, and his journey toward self discovery through a rekindling of something he feared he may have lost. When Mark Hogancamp is violently and brutally beaten to within an inch of his life outside a bar, he suffers serious brain damage and loses most of his memory. Through physical therapy he is able to recover the majority of his faculties, but still must carry the heavy burden of severe psychological and emotional damage. Once a bitter alcoholic, Hogancamp takes advantage of his new blank slate and sets out to reinvent and express himself in a fresh way. As a means to further his own kind of therapy, strengthening his motor skills and mind, Hogancamp constructs a miniature WWII era town, filled with dolls that represent himself, his friends and family, and his own original creations. He calls the town Marwencol, and soon weaves an actual narrative through its tiny streets, depicting the strange and complicated lives of its inhabitants by taking pictures of the toys and locations he reconstructs. What follows is a fascinating journey into one man's own damaged psyche, determined to heal itself. Constantly under attack by evil SS troops, and defended by a beautiful but deadly gang of women, the town and the stories Hogancamp creates, parallel his own painful history and desire for companionship. A complex mythology is created, with numerous characters and subplots complete with time travel and intricate twists and turns which would make even the creators of 'Lost' proud. The detail, care, and genuine love that Hogancamp puts into the town, his dolls, and wonderful photos, is astonishing. The type of emotion that he captures and elicits from mere pieces of plastic is at times equally mesmerizing and heartbreaking. Hogancamp puts a part of himself into each pose, each snapshot, and each new story development. To him these dolls take on a life of their own, and the film showcases the town and its citizens in a manner which mirrors that fact. Malmberg wisely presents the documentary in a restrained, but still artful manner. Hogancamp's personal story, from his horrible accident, to his newfound art, to other surprising self discoveries along the way, are all handled expertly. Recreations of stories from the town are depicted through still shots and narration from Hogancamp, and are all nicely woven into an overarching narrative, showcasing his larger personal journey. Malmberg never lets his cinematic tricks or techniques overshadow his subject, and he knows when to shift the focus from the fictional world of Marwencol, to the real world of Mark Hogancamp for best dramatic effect, all while maintaining a stripped down but interesting style. In many ways, 'Marwencol', can be viewed as a kind of companion piece to one of 2010's other excellent documentaries, 'Exit Through the Gift Shop.' Both are about the birth of an artist, but where Banksy's playful subversion questions what truly constitutes art by illuminating the superficial and often silly realities of its market, 'Marwencol' may in fact provide a suitable answer. With Mr. Brainwash's quick, mass produced and seemingly soulless works, we see a kind of art that is only made popular and "official" through the precarious validation and interest of the trendy, rich, and famous. What Malmberg manages to capture in 'Marwencol' is the complete opposite end of the spectrum. Here a different kind of art is illuminated, the kind of deep, painful, achingly, personal work that can only come from a true spark, from true creativity, talent, and yes, loneliness, loneliness, loneliness. Where 'Exit Through the Gift Shop' showed us an artist intent on becoming famous and successful, 'Marwencol' shows us a man, who even after his works are displayed in a prestigious gallery, still doesn't view his accomplishments as actual art. For Hogancamp, they were, are, and always will be his therapy, something he does only for himself, simply because he needs to. He may not mind sharing his creation with others, but that's not its function. Hogancamp created a world of his own and though we may be privileged enough to visit from time to time, it will always remain, irrevocably, his. 'Marwencol' is a beautiful and powerful testament to the spirit of imagination. As Hogancamp's painful, joyous, and bittersweet story comes to its ultimate, cyclical conclusion, we are left with one of the most interesting, unique, and thoughtful documentaries made in recent years. Hogancamp desperately feared his imagination would not survive his terrible brain injuries, but thankfully for him, and the rest of us, he was wrong. Though some may potentially find Hogancamp's dependency on his imaginary creation unsettling at times, it's hard to not feel triumphant for him as he makes certain strides toward the finish. In the end, he created an entire world for himself, exemplifying the power of healing through art. 'Marwencol' reminds us, that if we are only able to see the world around us as it truly is, we are in fact blind. Though the packaging indicates a 1080p presentation, the video here is actually provided in a 1080i/AVC MPEG-4 transfer in the 1.78:1 aspect ratio. This discrepancy is mostly negligible, as I doubt little difference would have been readily evident given the material. The video here is purely functional and nothing more. Compiled from what appears to be fairly low budget HD shooting equipment, the transfer is mostly underwhelming. There is little detail and depth in the majority of shots. Colors are fairly muted, and contrast can appear too high or low at times. The only exceptions to these issues are the close up shots and sequences featuring the actual town of Marwencol. These mostly still shots look rather nice on screen, exhibiting some good detail and colors. There is some artifacting, and some shots do appear to come from upscaled standard definition sources, but overall, the video here is an accurate representation of how the film was shot. Though certainly not demo material, it doesn’t have to be. This is how the film is supposed to look, and it's probably as good as it ever will. It's hard to fault the transfer for a low budget shooting style and even harder to fault the filmmakers for choosing that method. The video here complements the subject matter, and though not exactly cutting edge, it's perfectly acceptable. Provided in an English DTS-HD MA 2.0 track with no subtitle options, the audio is also purely functional. Audio quality varies a bit from scene to scene and interview to interview, with some areas sounding worse than others, exhibiting some hissing and other minor issues. There is some directionality between the left and right speakers, but nothing particularly note worthy. Dynamic range is flat, there is no real bass activity, and balance places emphasis on dialogue and narration. Overall, though mostly taken from low quality sources, that like the video, show the film's low budget roots, the audio accurately presents the story. A souped-up surround mix would have been disingenuous, and this stripped down but perfectly workable stereo track fits well with the tone of the film. 'Marwencol' features a nice array of supplements, though all are provided in standard definition (with the exception of the Photo Gallery) and stereo sound with no subtitle options. In addition to the disc extras, an introduction by film critic Elvis Mitchell and a collectable mini-print are included in the package. These extra bits are nice to see, but an HD presentation and an interview with the actual filmmaker would have helped bolster its value. 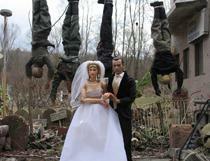 Eight Additional Marwencol Story Sequences (SD, 12 min) - More stories from Hogancamp's fictional world of Marwencol. Divided into eight parts, they can be viewed separately or together. These extra stories follow the same style of narration from Hogancamp over still shots, and are just as creative and insightful as the stories included in the film. Deleted Scenes (SD, 19 min) - Seventeen deleted scenes, viewable separately or together in one chunk. Overall, these scenes are just as interesting as the material included in the film and provide some more insight into Hogancamp's personal life and his healing process. Mark's Reaction to the Film (SD, 2 min) - A brief interview with Hogancamp taken directly after his first viewing of the completed film. Mark's "Red Carpet" Premiere (SD, 1 min) - A short and sweet look at Hogancamp creating a miniature red carpet for his tiny cast of characters outside the actual premiere of the film. 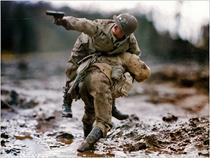 Photo Gallery (HD) - A nice collection of photographs taken by Hogancamp of Marwencol. Presented in 1080p, the stills look wonderful, showcasing Mark's amazing attention to detail. Theatrical Trailer - The trailer for the film. Also Available from Cinema Gold - Eight additional standard definition trailers for other releases from Cinema Guild. 'Marwencol' is a wonderful peek into a strange, creative, entertaining, and at times sad world forged by a man who needed an outlet. Handled with the same love, care, and artistry that Hogancamp displayed with his own creation, the filmmakers present their subject with respect and honesty. The video and audio are by no means impressive, but their presentation is mostly likely inherent to the source, and never take away from the powerful film. Supplements are interesting but some insight into the actual filmmaking would have been nice. This is a great film, one that comes highly recommended.